The quote seemed to resonate with quite a few people so I thought I’d share some more wisdom from the neo-futurist architect who has inspired so many. As someone who has chosen to dedicate their life to helping others find their passion, I completely resonated with everything that Fuller said in the quote above. I meet so many people who are slowly wasting away their lives trying to earn a living, when it doesn’t really have to be that way. I firmly believe that we all have a unique skill or talent that is just waiting to be discovered and utilised in our lives…something that will make us come alive and express who we really are. In-fact I know this to be a fact because I help people find out what is unique about them each and every week. And I think what can happen sometimes is that we get so obsessed with earning a living that we forget to find out what we might be genuinely passionate about in life. We get stuck in a rut so-to-speak. I guess we are creatures of habit after-all. 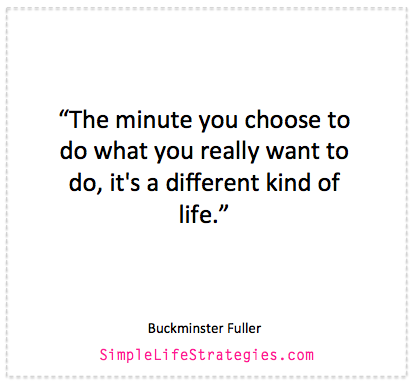 So thanks to Buckminster Fuller for this reminder that there is more to life than just earning a living. Anyway, enough about the history of the man, I thought I’d share some more of his quotes because quite frankly they are too good not to share. Take your time to cruise through the quotes below. Take in the ones that resonate with you and leave the ones that don’t. Maybe even share the ones that make you feel something. Tell me – what do you think of Buckminster Fuller? Which quote resonates with you the most? I’d love to hear in the comments below. PS – In January 2015 I’ll be opening up a limited number of spots for my Passion Program. This course has been designed for smart professionals who are looking to find their passion. You can add your name to the wait list here >> Passion Program. “Integrity is the essence of everything successful” – Never a truer word spoken and why so much in the World is broken! Wow, I’m a poet and didn’t knowet! Thanks for your valuable insights Zoe, I love what you do. I just need to find the courage and discipline to act on things we all know, deep down, to be right and true. We’ve made life way too hard! Thanks Chris 🙂 I like your rhyming styles! You hit the nail on the head – we already know everything we need to know…it’s just we get in our own way 🙂 Thanks for your comment. I really appreciate it. To courage! Thanks for your insightful post Zoe! Personally I love being unemployed and haven’t had a job for 10 years now, since I bit the bullet and started doing what I love for a living. But it was a pretty scary decision to take and I had to do it in baby steps. I read somewhere that 95% of people would rather make a bad decision and face the unknown. I totally get that. Fear can really keep you stuck in one place – and it can be contageous! If you are not living in joy, you are out of integrity with your soul. ~ Michael Beckwith.